Monitor Audio Platinum PL500 II Reference Speakers. 0% Finance available - Contact us for details. 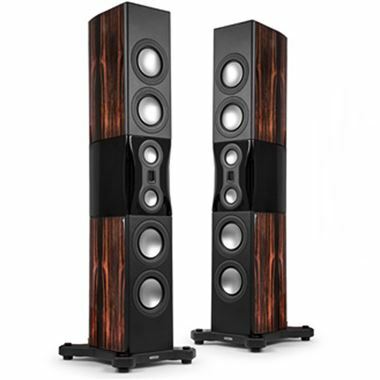 Measured against its peers, there is no finer audio ambassador than the majestic Monitor Audio PL500 II. Here you’ll discover the essence of Platinum II engineering: silken layers of the finest high frequency definition suspended on an explicit midrange, seamlessly underpinned by a deep, clean and responsive bass foundation. More than ever the sound has a physical authority, conveying the ‘live’ character of instruments, voices and atmospheres as if they had materialised three-dimensionally in the air around you. This is fidelity in the raw, magnificent in stature, seductive for its rhythmic subtlety and utterly captivating in the sheer magnitude of its dynamic impact. Our most sophisticated system of no fewer than four 8” RDT®II bass drivers, twin 4” RDT II midrange transducers and MPD tweeter will render the entire harmonic sweep of every work with pin sharp timing and accuracy. Your music and film sound alive, immersive and uncompromised.